Aftershave is an essential concluding step to a great shave. 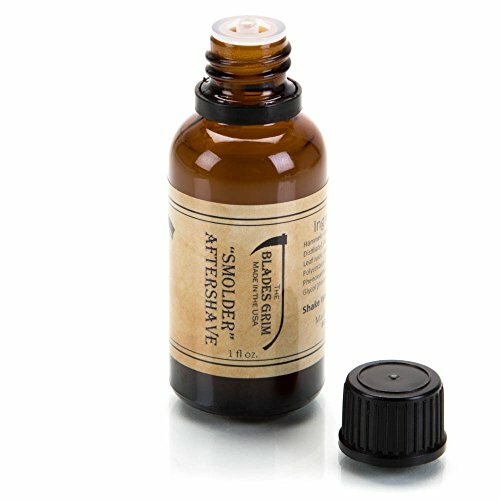 Enjoy a Luxurious and Comfortable Shave with our Blades Grim Smolder Aftershave. This Aftershave is specifically formulated to give you a clean and comfortable conclusion to your shave. It will help cool and calm your freshly shaven skin and that is the measure of a great aftershave (how well it cares for your skin after a shave). The scent is our much loved Smolder. It is a warm and toasty mix of Venezuelan Tonka, Orange Peel, Mandarin, Coriander Leaves and Star Anise. Made in America. American Made - Supports the U.S. economy wall promoting fair Labor & product quality standards. If you have any questions about this product by The Blades Grim, contact us by completing and submitting the form below. If you are looking for a specif part number, please include it with your message.